Greatest runner of all time says democracy can't come overnight as he targets a new career in politics. But he hopes he can lift the pace of progress. "Yichalal" is a word made popular in Ethiopia by Haile Gebrselassie, arguably the finest distance runner ever to grace track or road. It means "it is possible", or "it can be done". Gebrselassie for president? Yichalal. That was the widespread reaction last week when the 40-year-old, who has conquered the worlds of sport and business, announced that in 2015 he will be running not for gold but for political office. The only dissenting voice appeared to be that of his wife. In many ways, politics seems a natural next step for a man whose rise mirrors that of the skyscrapers in Addis Ababa, the capital of Ethiopia, where Bob Geldof is now a less likely foreign visitor than investors lured by one of the world's fastest growing economies. Gebrselassie, an idol to millions with that crucial political asset, a winning smile, is seen as embodying the new optimism also sweeping much of Africa. "We Ethiopians had many problems," he told the Observer last week, speaking by phone while driving towards Addis Ababa. "If you come to Ethiopia now you see the difference. Things are changing very fast." But despite projected growth of 11% next year, poverty remains widespread. "Now Ethiopia is moving in a good way but the speed is not what we need," Gebrselassie said. "We need to move more quickly and join the middle-income countries. There is no Usain Bolt. The more you sprint, the more you break world records. If I become an MP I will push for a pick-up of speed." Few would bet against the 8½-stone runner who has defied injuries, lifelong asthma and the passage of time. One of 10 children raised at high altitude in the hills of Asala, 160 miles south of the capital, he used to run six miles to school and back every day. He won his first official race when he was eight, took part in his first marathon at 15 and, at 18, was discovered by the Dutch former distance runner Jos Hermens, who remains his coach and agent. Gebrselassie won Olympic gold medals in the 10,000m in Atlanta and Sydney and claimed four world titles at that distance. He switched to the marathon and was still able to smash his own world record at the age of 35. In all he set 27 world bests, although some of them were not over officially recognised distances. He became known for a distinctive running style with the right arm swinging back and forth while the left remains static – he says this developed when he was running to school carrying books. Yet all the time he was also building a business empire, riding the wave of Ethiopia's economic renaissance to become one of its richest men, employing hundreds of people. Typically rising at 5am, he owns a hotel, cinema, car showroom and a property business that has financed several of the capital's tallest buildings. Recently he opened a coffee farm. And it will do Gebrselassie's election prospects no harm that he is also a philanthropist. He has built two primary schools in Ethiopia and is heavily involved with the Great Ethiopian Run, which works with NGOs and the UN to raise awareness of education and health. So why politics? "Why? Good question," he laughed. "I've always wanted what is useful for the country and myself and the people of Ethiopia. I've been in athletics for 25, 26 years and it's time to share my experience with others. When you do sport, you're alone, but in business you work with others, and in both you have to win. In politics, too." Gebrselassie already has some political experience as a member of the Elders, a group who have mediated in political crises in the country since 2005. His next target is a seat in parliament at the next election in 2015 and, such is his wild popularity, he knows expectations will be high. "They will ask me: 'What is your plan?' I cannot do everything they need. 'I will try to plant the first plant, and the rest you can do yourself.' It's hard to explain: I don't know the language yet." Asked if he would like to be president one day, he replied: "Who doesn't like that?" The Ethiopian presidency is a largely ceremonial role given to an individual without party affiliation, whereas true power lies with the prime minister, currently in the iron grip of the ruling Ethiopian People's Revolutionary Democratic Front (EPRDF). There is only one opposition MP in the 547-seat parliament. Gebrselassie is adamant that he will run as an independent candidate, saying that he agrees with the EPRDF on some points and disagrees on others. He is evasive when asked about the criticisms of authoritarianism and human rights violations. "For me it is difficult to say. I need to know what's going on. If you come back after three years, I will answer that question." It was only in 1991 that civil war ended with Ethiopia's repressive communist regime being overthrown, he recalled. "Human disaster happened in this country. Millions died in the 'red terror' [in which hundreds of thousands died in the late 1970s]. Are you expecting Ethiopia to become a democracy like America or the UK? Of course everybody likes good government, but we are young. If you look back 20 years at what we had, what do we expect? My hope is in another 20 years it will be better than now." Expressing a sentiment that echoes some of Africa's longest serving leaders, Gebrselassie added: "It's better to have a government without democracy than no government. In our neighbour Somalia, they didn't have a government for many years. Do you think they had democracy? They lost everything. You cannot bring democracy overnight. First you have to educate the people and show them how things are done." Such an approach is unlikely to win plaudits from Amnesty International, which has accused the EPRDF of stamping out dissenting voices, dismantling the independent media, obstructing human rights organisations and strangling political opposition. It says Ethiopia's jails are packed with suspected political opponents. Claire Beston, Amnesty's Ethiopia researcher, said: "Haile Gebrselassie would be hugely popular and it would be very difficult for the government to react against him as they have against other opposition leaders if he was outspoken and called for reforms. We hope he will. The presidency could be used to great benefit in relation to freedom of expression and the right to participate in the political process." Analysts agree Gebrselassie's status in Ethiopia will make him all but untouchable. Hallelujah Lulie, a researcher at the Institute for Security Studies in Addis Ababa, said: "Most ministers have a positive attitude towards him. I don't think they'll intimidate or arrest him. They won't crack down as they do against other opposition parties." 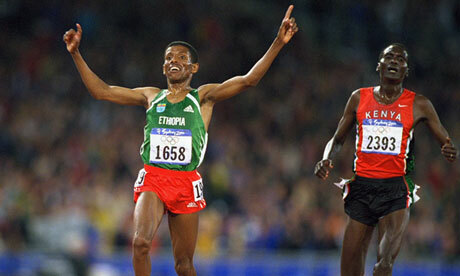 Known for his single-minded determination, Gebrselassie can become an inspiration on the political stage, Lulie added. "The political sphere is deeply polarised. Haile Gebrselassie is one of the few unifying figures we have in this country. In the 1990s the only good news we had in Ethiopia was his victories all over the world. He's a well-disciplined workaholic and he represents the ideas Ethiopians should work for. From him we learned the motto, 'It is possible'."